This 1900s villa is set up for both relaxing and business trips, families with older children, couples or small groups. It has plenty of character from the gardens to the decor. It sits on a tree lined street with a creek behind it. From the deck you will hear the birds chirping and water running while you cook on the bbq. The cottage garden is charming when in bloom. The house is comfortable and cosy in winter with a wood burner and heat pump. The bedrooms have panel heaters and there is a heat transfer system which can keep the house at a comfortable temperature. The beds have hypoallergenic mattress and pillow protectors and quality cotton sheets with bedding for all temperatures. The shower has great water pressure and there is a separate bath which is ideal for unwinding. The living room is cosy and sits on one side of the fully equipped kitchen with entertainer's oven. On the other side of the kitchen is the dining room which seats up to six. There you will find a book and DVD collection to keep you entertained and lightning fast Gigatown internet speeds to use with your devices . If you are driving there is off street parking and plenty of additional parking on the street. There is also a bus stop 3 minutes away and the Botanic Gardens, Garden's supermarket, various eateries, bars and a pharmacy are all a leisurely 20 minute walk or 5 minute drive away. The University is a 7 minute drive or a 30 minute walk through the Botanic Gardens. The Forsyth Barr Stadium is 10 minutes by car and it is 15 minutes to the city centre, the hospital and pretty much any other amenities you will want or need during your stay. Smoking is allowed outside only. This property is not suitable for toddlers or young children unless always attended as the fencing may not keep them in the property. Older children are welcome. Even though it has been thoroughly cleaned, as there was a cat living here, this property is not suitable for people with cat allergies. No parties. Please leave the villa clean and tidy. Hi there, my name is Nadine and I am a photographer who lives in Dunedin, a brilliant small city filled with arts, great food and even better coffee. My partner Jake originally came from Korea and is a home handyman and golfer by day and a chef, creating some of that great food, by night! This house, built at the start of last century was originally purchased as my home because I loved the features, the feel and the light. I also loved the rambling cottage garden and the green and private back yard. I always wanted a house with water nearby and when there is enough water in the creek, the sun is high, and the trees green, it is like being in the countryside. It is situated in North East Valley which is a great part of town filled with friendly people and small local businesses. 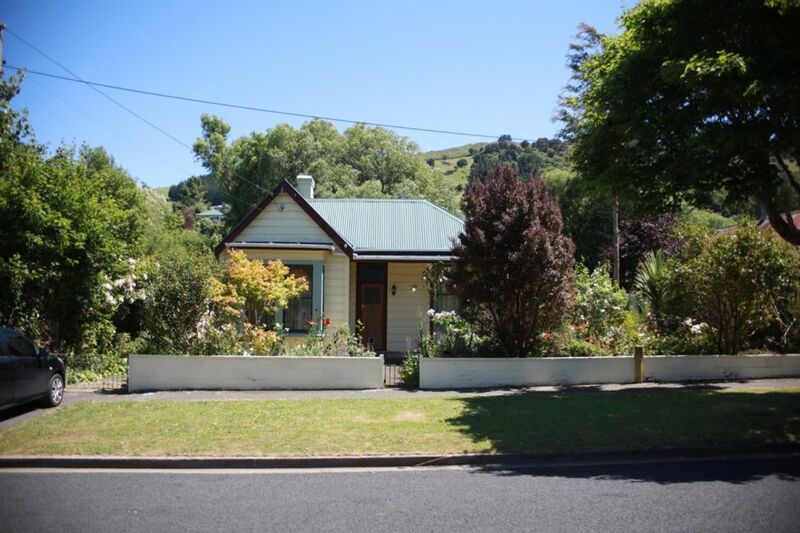 An ideal house for relaxing but also in walking distance to Baldwin Street, the world's steepest residential street! It is also in walking distance to the bus stop or the Gardens supermarket and other stores. It is a 10 minute drive to the stadium, and 15 minutes in busy traffic to the city centre, the beach or pretty much anywhere! I love vintage and retro furnishing and this house suits the items of furniture I gathered over time. Gas heats the hot water for the bathroom. The shower has wonderful water pressure and the freestanding claw foot bath is terrific for relaxing. Wood burner in the living room, heat pump in the dining room, panel heaters in the bedrooms and portable free standing column heater to move around as needed. All bedding is high thread count 100% cotton and provided at no additional cost. All beds have electric blankets, including the sofa bed when made up in the living room. Miele washing machine in the laundry and detergent is supplied. Wood burner in the living room with plenty of firewood provided. Off street and on street parking available. There is a car port on the property. Bath towels, hand towels, flannels and bath mats provided in the bathroom. Tea towels and hand towels provided in the kitchen. There is a wood burner in the living room in addition to a dvd player and a large collection of DVDs and CDs (kept in the bookshelf in the dining room). We provide various teas, coffee, oil, salt & pepper. Help yourself to any other items in the pantry. Spacious fully equipped kitchen with entertainers oven, gas hobs, butlers sink, dishwasher and wooden bench tops. A separate dining area with space to seat 6. Play CDs through the DVD player in the living room. There is a collection of CDs stored in the dining room. The book collection covers most genres but especially easy holiday reading from Lee Childs, Janet Evanovich, Vince Flynn and Daniel Silva. Also history, poetry, art and cooking. There is an extensive collection of DVDs including art house, classics, action, children's, drama and so on. There is a well established cottage garden and lawn to the side of the house and winding through the garden. The deck is in the backyard. There is seating at tables for 6, a sun umbrella, outdoor seats and solar fairy lights that come on in the evening. Smoking is acceptable in the back yard. We adored staying in this fabulous house. Quirky and full of character, it had everything we needed and more. Lovely linens, fresh flowers, plenty of DVDs and truckloads of books and magazines made it a welcoming and comfortable stay. Thanks to hosts Nadine and Jake for sharing their house with us. The cleanliness was amazing and very welcoming, great communication with owners, very homely with personal touches of flowers, fire ready to light, coffee/milk, plenty of books/dvds, handy to stadium by car, quiet street, lovely park like grounds, and inside decorated beautifully with lots of retro vintage things. What a lovely English cottage! A place for relaxation. The cottage was amazing. We enjoyed tea out in the garden. Everything was so clean and tidy. We wish we could have stayed longer! Thanks for the lovely review and looking after the house so well. We are also sorry you couldn’t stay longer and hope your travel home was comfortable. Everything was perfect with the house: charming, comfortable, everything one could need, beautiful garden. The house was immaculate. The owners are clearly paying attention to every detail and care about providing the best experience for their guests. We would rate more than 5 stars if possible. Thanks for the lovely review. It makes us very happy when people enjoy their stay as much as you did. Such a cosy welcoming little Villa. Highly organized operation. Great comunicaton from owners leading up to our stay. Comprehensive instructions on arrival. The cottage has everything you need. I was particularly impressed by the fire. All the wood, kindling and paper easy to access. Warm. Comfy beds and Absolutely loved staying here. Thanks for the lovely review. It was our pleasure and you would be welcome back any time. Signal Hill Lookout and Bracken Lookout are both a short drive from the house. For the fit who are good with going uphill, from nearby Bethune’s Gully there is a dirt path up to the Mt Cargill lookout. Alternatively you can take the still steep but shorter walk to the top from the Organ Pipes. If that is all too ambitious you could simply take the very short walk to stand at the bottom of Baldwin Street, the “world’s steepest residential street” or even attempt the walk to the top!